It’s time for another giveaway! 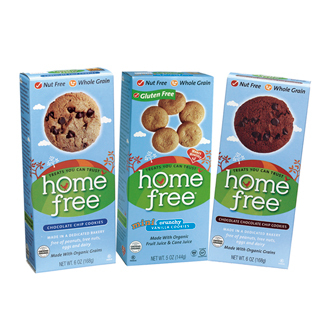 The generous people at Home Free Treats sent us some of their certified gluten-free and top-8 free cookies to try. They also offered to send a box to one of my lucky readers. Trust me when I say, you are going to like these! No peanuts, tree nuts, eggs, wheat or dairy, soy (except lecithin), fish, shell fish, or sesame are permitted in our facility for any reason at any time. The only soy in our facility and some of our products is soy lecithin, which is tolerated by most (but not all) people with soy allergies. Every shipment is wiped down before it is allowed in the kitchen. The staff wear special clothing to prevent carrying allergen traces into the kitchen. After taking every precaution imaginable, they run random allergy tests to make absolutely sure there is no cross contamination. I appreciate that they also use natural and organic ingredients and are committed to avoiding GMO products. We were given a full size box of chocolate chocolate chip cookies, an individual packet of chocolate chip cookies and an individual packet of vanilla cookies. I tossed the individual bag of chocolate chip cookies in my purse. A few days later, I found myself out with the kids. The non-allergic kids wanted ice cream. It had been a while since we had splurged on a treat so I gave in. I handed the kids their ice cream cones. Bella knew their was nothing there she could have. She didn’t complain. She didn’t even ask for anything. I wish I had a picture of the look on her face when I reached in my purse and pulled out chocolate chip cookies. It was priceless! After her first cookie, she said, “These are really good! They taste like my other cookies!” The other cookies she was referring to are her favorite Lucy’s Chocolate Chip Cookies . I sampled one myself and I have to agree. They were delicious! Are you ready to win some cookies? Like Home Free Treats on Facebook or follow them on Twitter and leave a comment letting me know. This giveaway will end on Friday, February 24th at 10:00 PM EST. The winner will be selected by random.org and will have 7 days to respond or a new winner will be chosen. Open to residents of the USA. Disclaimer: Home Free Treats sent me cookies to review. I was not under any obligation to write a positive review or sponsor a product giveaway in return for the free product. All opinions are my own. I would love to win…the vanilla cookies are so good! Please enter me in this contest. I know the look that you are talking about. My 2-year-old had the same expression tonight when he saw his older brother get Oreos at a restaurant and I pulled a granola bar for him out of the diaper bag. They just wanted to be included! I would love to win these for my almost 2 year old daughter! Wish they made these without the Soy Lecithin :-/ I am scared to ‘test’ it. Good to see more companies that are allergen free though! @Andrea – Just want you to know we do make varieties without soy. Any of our cookies without chocolate chips are free of soy lecithin (Vanilla Minis and Soft Oatmeal). When we make our cookies, we dedicate specific days to one particular flavor/variety and thoroughly clean the equipment in our kitchen in between batches to ensure no cross-contamination. Hope this info is helpful! If any questions or concerns please let us know! Wow! Thank you Kira! I just checked out the website and am following you on facebook- Please add me to the contest! I have a friend who has celiac disease that would love to have the items with the lecithin I wouldnt be able to eat. I would love to win these Gluten Free Products. I am recently gluten free and looking for good product that also taste good to me. I am excited to try this if I win. I have recently found your website and LOVE IT! Oh we love your cookies…we want to win! We got to sample a box of these too, and we really loved them. I am working on my local stores carrying them..the ingredient lists are much more impressive than your average allergy free cookies out there…ingredients i use in my own kitchen! My son would love to try these. We haven’t seen them anywhere. We love these! I want to win! I follow Real Food Allergy Free on FB and via email. Ohmygosh, those cookies look so good! I’d love to win!! Hi Aaron, I’m sorry the giveaway is over. The cookies are wonderful and you can order them from their website or have your grocery order some.